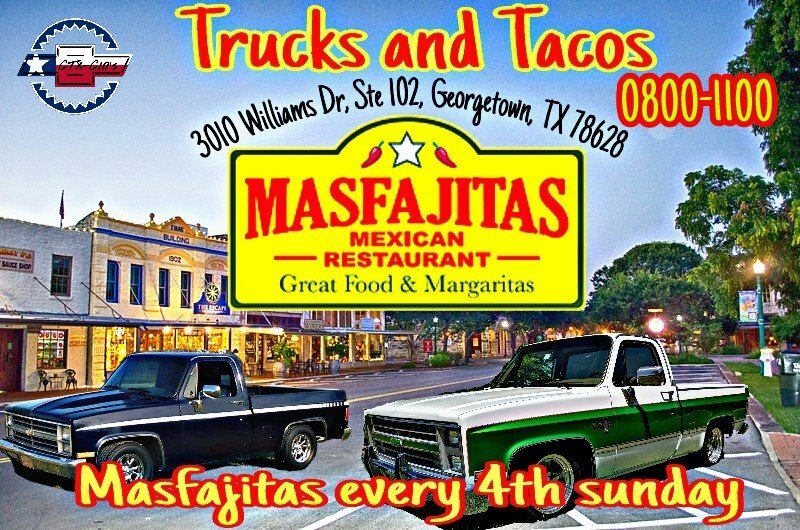 Trucks & Tacos is a Monthly Meet & Greet held in Georgetown on the 4th Sunday on the Month. Kid, Family friendly from 8-11, sometimes later, Held at the MasFajitas parking lot 3010 Williams Dr, Georgetown. Breakfast is available at MasFajitas. Please be respectful, No Loud Music or Burnouts in the Parking Lot. Additional Info Email rvschevy@hotmail.com or eliseo.sanchez27@gmail.com.